We are celebrating "Dot Day" again this year. 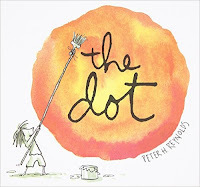 Dot Day is inspired by The Dot book by Peter Reynolds. 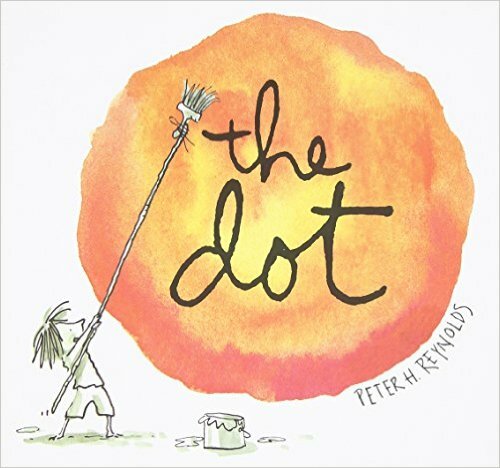 The Dot is the story of a teacher who encourages a student to trust in her own abilities by being brave enough to "make her mark". What begins as a small dot on a piece of paper becomes a a challenge to create bigger and more inspiring things. This movement has gone on to connect students and classrooms around the world. This year, I made the "D" page in my kinder journal D is for Dot Day. I shrunk the page that was given on the website to use with the Quiver 3D app and had the students color. Then they brought their journal to me and we made their dot come alive. It was so fun to see the amazement on their faces as their dot became 3D. I also wanted to get in on the skyping part of Dot Day, so Matthew Winner and I connected our kinder classroom - Texas to Maryland. The students from each class shared some of the Dot Day activities they had done and we please to discover that BOTH classes had made dots out of their initials. While we were waiting for Mr Winner to call us, we sang the Dot Day song. A fun Dot Day today and we have more stuff planned the rest of the week. I love special events like this that put the "FUN" back in learning.